Welcome! You’ve landed in the right spot to get Hive set up the way you want to work. Hive takes everything your team needs - quick chat, tasks, projects, and files - and puts them on one dashboard. Together, with the power of flexible views so you can work the way you want, and predictive analytics about upcoming issues, Hive is working just as hard as you are to keep your projects on track. Ready to go? Create your Hive account, and get started with the steps below. Start by entering a few tasks on your own My Actions list, by using the blue +New Action button in the top right, and selecting yourself as the assignee. 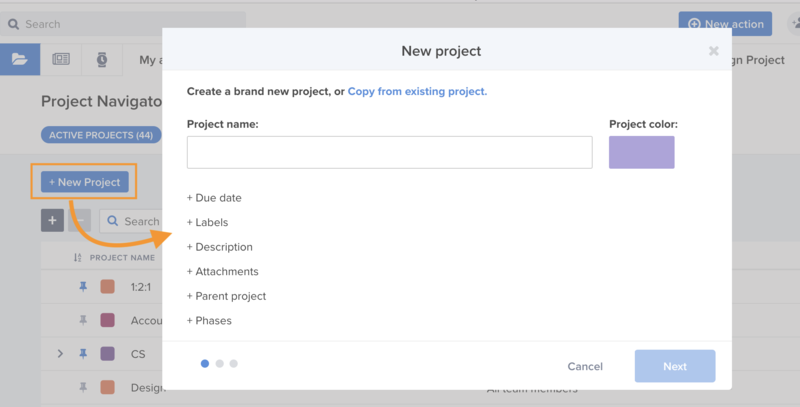 Enter at least 3 tasks for upcoming work you have to complete, select a due date and check them out on the My Actions tab along the top navigation bar. Don't forget - that blue +New Action button is the place to assign actions to your team as well. Now it's time to think about who will need access to Hive so that they can be be assigned work, comment and collaborate, attach files, review progress, move projects forward to the next stage, and close them out. Organize everyone. 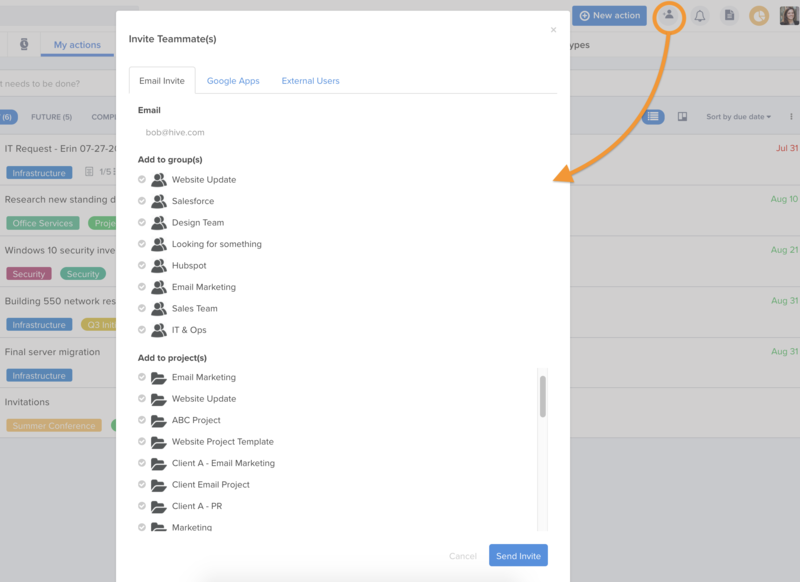 If your co-workers are organized into departments or teams, you'll want to add that team structure to Hive so you can more easily add them to projects, and specifically @mention a team in chat groups and comments. You can find the Teams section from your profile menu (your avatar in the top right), then selecting Your workspace > Manager Users. Include any external users. Collaborate with freelancers or work closely with clients or vendors? Add them as an external user. They will have access to a single project, and its associated chat group, if one exists. Click to that External Users tab as shown in the above screenshot, to add an External User to one project. 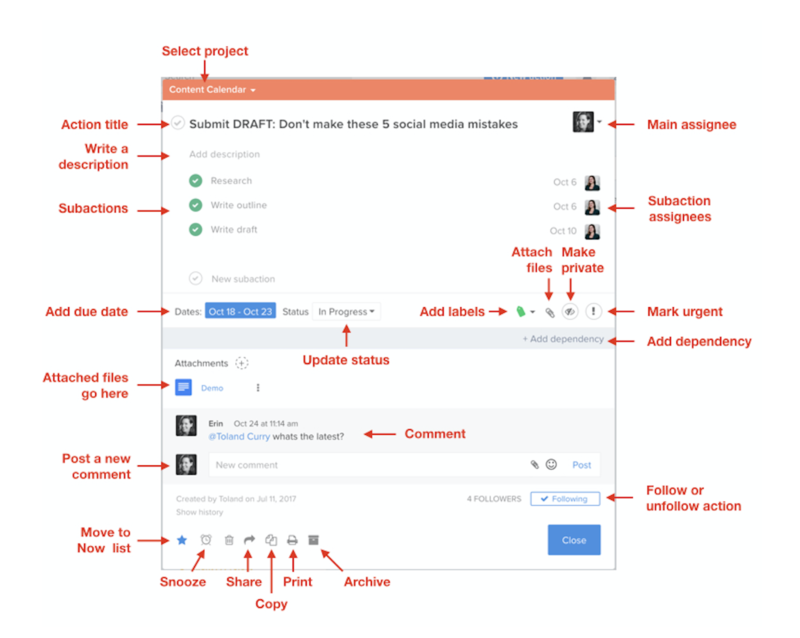 Now that you have a few tasks on your own to-do list (My Actions), and invited your colleagues and organized them into teams, let's start entering projects. Attachments - stored in the project details area. Parent project - you can make this project a child or sub to a parent project. We recommend making Parent projects if you have many client projects under the same client, or you have departments, and sub-projects underneath each department in your organization. Phases - If your work is ordered into different lifecycles, we recommend adding them as phases. On the next screens you'll pick the layout, and decide on the sharing permissions. Check your Notifications feed - (look for the bell icon in the top right) - it's your command central for tasks and items that need your attention. You can always choose when and how you get notified, too. What type of work does your team do, and what's your primary goal for using Hive? We power many teams - and have several examples of a marketing, product development, software development, human resources, content marketing, and branding/client project setups. If you haven't already added those project templates during the on-boarding screens, send us a message and let us know what template you're looking for, and our Customer Success team will be in touch. Setup your integrations. Check out our available integrations through Zapier. Ask us anything. Use the blue question mark in the top right of the app to reach us, or visit our Help Center for more detailed articles.